A limited number of places are available to pupils who are likely to achieve strong results in their GCSE examinations. Entry is competitive and successful candidates are likely to be predicted A* and A grades at GCSE or IGCSE. Wednesday 12th June 2019, from 5.15pm. A chance to tour the School and learn more about our Sixth Form. 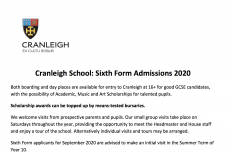 Email admissions@cranleigh.org for further details. The Sixth Form A Level Options Evening will take place in September. Please book a place by emailing Admissions office on the address above if you would like to attend this. This event provides applicants with the opportunity to hear about the curriculum, co-curricular activities, and future plans for the school. There will also be the chance to meet Heads of Departments to talk about A Level options, and to enjoy a tour of the school with a current pupil. Follow up visits and individual visits may be arranged via the Admissions office. 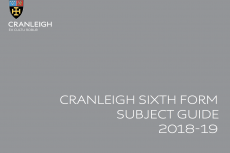 If you wish to be considered for a place at Cranleigh, a registration form and non-refundable registration fee should be submitted by the closing date at the end of September in Year 11. Registration forms are available with the prospectus, or are available digitally, by emailing admissions@cranleigh.org. Candidates must be over 15 and under 17 years of age on the 1st September in their year of entry to Cranleigh. Registered candidates will be invited to attend an interview and assessment in November of Year 11. Assessment for Sixth Form places consists of the requisite predicted results at GCSE, verbal and non-verbal reasoning papers, a written English paper, and a satisfactory report from the candidate’s current school. Candidates will also be required to attend an informal admissions interview, which will comprise an holistic review of the candidate’s specialised academic subjects plus their interests and abilities in extra-curricular activities. Following interview and receipt of a positive recommendation from the candidate’s current Head, a conditional offer will be made. This will be dependent on successful completion of GCSEs with the required grades. Offers will be made from December onwards, dependent on availability of places. Cranleigh offers academic and other scholarships. To gain an award, candidates must demonstrate excellence in their chosen field. For further details of awards please see the Scholarships and/or Bursaries pages of our website. Places are confirmed subject to candidates achieving the required standard at GCSE. On receipt of an offer, confirmation of acceptance must be received within two weeks.